Last night we were very comfortable, warm and slept well, early to bed and up for 5:00 breakfast in the mess tent. The crew brought us bowls of warm water to wash up, provided towels on the cots. They think of everything. Birding, walking and a picnic lunch as we work our way all the way to the Indian border to Gelephu for the night. We saw some great birds today including the large Rufous-necked Hornbill, hard to miss as it glided through the valley at lunch. 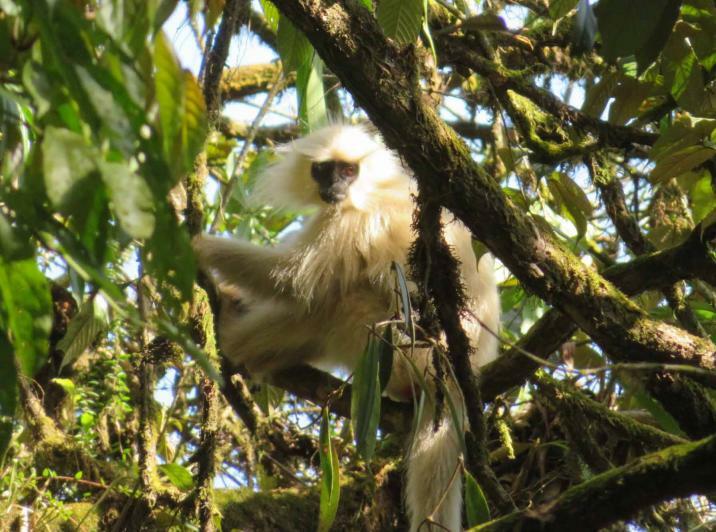 A troop of Golden Langurs, not commonly seen, also can't be missed. Their white fur and long tails ripple through the trees as the troop moves through, their mane going every which way. Now in the lowlands along the Indian Plain, it is hot and looks entirely different from cities we've been through. Today was market day with a wide selection of produce and meat one block from our hotel. The hotel is modest but air conditioned when the power works which it did not when we returned from a hot late afternoon walk at the sewerage ponds for water birds. However, it is nice to have bags delivered each day to our rooms since elevators seem to be scarce. And we're always two to three floors up. Tomorrow night we will be camping again so no wifi until Sunday.